Bishop Thom asked that I help them understand and address issues of the “spiritual but not religious,” inclusion of rising generations in leadership, and being outwardly focused on God’s mission in their unique communities rather than dwelling inwardly on their uniquely Episcopal stress points. I accomplished a good amount of reading in my preparation to address the convention in an effort to help clarify the difference between a generation, defined by the chronological cycle of birth dates and cultural references, and a Generational Cohort, defined by a cataclysmic event that causes a new value system demanding new structures in society. Embracing the idea of Generational Cohorts, which do not lump all Baby-Boomers together, was a helpful perspective. Thinking about cataclysmic events within the church, and how those events have impacted local faith communities, was also an interesting exercise for participants in discussions at their tables. Having the teenagers of Idaho’s Official Youth Presence at convention, along with a few articulate, energetic, and faithful Gen X leaders was very helpful and encouraging. What was evident to me was an amazing amount of energy and activity for mission across the diocese. I shared the Five Marks of Mission with the gathering as a tool for both observing the mission already lived out by the members, and to help discern what the Holy Spirit is calling them to do. The Five Marks of Mission provide theologically based, Baptismally sound, action language to name, claim, and engage mission. I asked the members of the diocese to bridge from one generation to the next in identifying, affirming, equipping and partnering with potential leaders in mission according to gifts, skills, needs, and passion. They responded with many stories. I witnessed the generous distribution of $36,215.36 in grants awarded to 14 mission projects across the diocese through the work of the Idaho Episcopal Foundation. We all affirmed the amazing and faithful ministry of members of St. James’, Payette, for their prison ministry at the Snake River Correctional Institution, as they were honored with the “Hands and Heart of Jesus Award” for 2013. And speaking of the Snake River, what an impressive and beautiful place in the world! I was mesmerized watching Base-Jumpers in Twin Falls leap from the Perrine Bridge, trusting in their skill and parachutes to bear them safely to the ground, 486 feet below the deck of the bridge. I marveled at this leap of faith being taken by people clearly participating in a spiritual and ritualistic experience. I suggested that Episcopalians in the area might consider offering blessings of parachutes and base jumpers from time to time, much as many Minnesota clergy bless motorcycles and riders each spring. I found many different and delightful Episcopalians in Idaho, singing the one song of the Gospel, loving God with all their hearts, minds and souls, and loving their neighbors as themselves. It was a honor and a blessing to be called to visit you, Idaho. May your mission live long as you continue to meet the needs of the world in your sacred space of creation faithfully following Jesus. Today’s Mission Monday blog post is by the Rev. 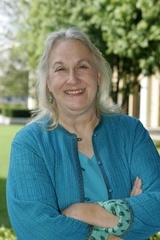 Sheryl A. Kujawa-Holbrook, VP of Academic Affairs and Dean of Faculty at Claremont School of Theology. She serves as professor of practical theology and religious education at Claremont School of Theology, and as professor of Anglican Studies at Bloy House, the Episcopal Theological School at Claremont. Sheryl originally wrote this piece for a mission exchange project initiated several years ago. As we resurrect this important project under the new working title, Episcopal Youth in Mission, her words are as timely as ever. I encourage you to carefully read and process Sheryl’s wisdom before planning your next mission experience. As the summer program season approaches, many congregations and dioceses begin planning social action or “mission” trips with young people. But just how meaningful are these “trips”? Such learning experiences can build self-esteem and leadership skills, as well as a greater sense of social responsibility. Yet well-intentioned projects far too often fall short of potential benefits, becoming primarily opportunities for travel on the part of the sponsors, and sources of anger or feelings of powerlessness for those visited. Some projects, emphasizing work and the desire to help others, only reinforce the status quo, rather than offering a transformative opportunity for young people to see the world anew. Social action projects for young people, in order to be transformative experiences, need to both educate young people on how oppression operates in our society, and stress how we, who are part of the dominant culture, participate in that oppression. Rather than patronize the poor and the oppressed, participants need to learn to recognize how God is already at work among those they encounter. These are just the opening paragraphs of this powerful article. Download the full article, Social Action Projects: More Excellent Way, for Sheryl’s criteria for congregations and dioceses planning mission experiences for youth. 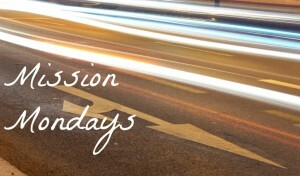 Today I am pleased to welcome Cookie Cantwell as our guest blogger for Mission Monday. Cookie is the Director of Youth Ministries at St. James Episcopal Church in Wilmington, NC and serves as the Province IV Youth Ministries Coordinator. Cookie has been extremely active in wider church youth activities, including the General Convention Official Youth Presence and the Episcopal Youth Event (EYE’14) Mission Planning Team. Some people may think this blackboard was accidentally left behind from a children’s program in the Church or perhaps it was a temporary list of people who were recognized for something they had done. This simple blackboard with 25 names on it was much more! This simple blackboard has everything to do with an essential component of a mission experience…PRAYER! PRAYER is the foundation of any mission experience! Spending intentional time in the presence of God and asking for God to guide you are the first steps as you discern why you are going on a mission experience, when you should go, where you are being called to serve, and who will accompany you on this journey of faith. As each detail of the mission experience is put together and as each person is called by name to participate, it is essential to have a group of people who are praying for your mission experience, for the “work” that will be done, and for the transformation that will occur. A simple blackboard with 25 names? This blackboard is actually the PRAYER LIST from a mission experience that Province IV Youth Ministries shared with the people of Buen Pastor Episcopal Church in Quito, Ecuador. The parishioners of Buen Pastor created this PRAYER LIST as our participants committed to sharing their lives with them. Each name was added long before our group met in Atlanta to board our plane. As we learned about this culture where we would be serving, this PRAYER LIST created a deep relationship between Buen Pastor and our group. Each day the blackboard with our names on it reminded us that we were there because God called us there to be in relationship with the people of this community. Each PRAYER that was spoken and each PRAYER that was said in the silence of our hearts created a unique and meaningful relationship with these people who have helped shape our lives forever. Four months later, we are back at home and our nine days in Quito are incredible memories. This life changing experience is still changing our lives. Not only are we allowing God to use our experience in Quito to guide us as we serve God in our daily lives, we know that this simple blackboard is still at the front of Buen Pastor in Quito, Ecuador. Each time the parishioners of Buen Pastor gathers, the Province IV Quito Quest 2013 Mission Group is surrounded by prayer! A simple blackboard…meaningful relationships…work and service…worship…sharing…hope, joy, healing, love…PRAYER! That is the essence of mission. Today, I welcome guest blogger Beth Crow. Beth is the Youth Missioner for the Episcopal Diocese of North Carolina. I’ve known Beth for many years through church-wide, provincial and diocesan ministry gatherings. I highly respect her ministry and her insights and I couldn’t be more pleased to share this post with you. I have been organizing youth mission trips for years: coordinating Vacation Bible School (VBS) for inner city children in Washington DC, painting houses on the Wind River Reservation, digging trenches for new homes in Costa Rica, and cleaning marsh areas of Mississippi after Hurricane Katrina. During all of these trips I have witnessed incredible strength and maturity in the lives of the young people traveling with me. But it was not until the summer of 2007 in Bay Saint Lewis with 150 youth from Province IV did I begin to truly understand the greatest gift any of us can give. This hope Malcolm experienced with the youth from Province IV came out of genuine relationships built through sharing work, laughter, tears, stories, and most importantly love with one another. Yes, the work done during these mission experiences is important and much appreciated. However, it’s the relationships developed during these experiences that last a life time. Blythe Riggan, a youth from the Episcopal Diocese of North Carolina, illustrates this type of exchange well in her article, Botswana Exchange: A Walk Beside. My hope is that through mission we build these ongoing relationships across the vastness and diversity of our church and that through these relationships we transform ourselves, our communities, and our world.